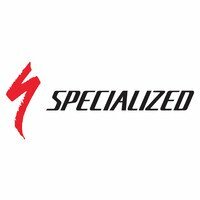 Specialized Enduro bicycle handlebar grips. More cushioned than regular grips. Specialized Enduro Grips have more padding and are therefore larger diameter than standard handlebar grips. Choose Specialized Enduro XL Locking Grip if you want to maximise shock absorption. Softer, thicker padding for comfort and shock absorption. Textured pattern for non-slip grip. Dual density compound for enhanced comfort and bar adherence. Firmer density inner core for easier installation. The locking clamp ensures secure attachment. Unlike standard grips, which need to be a narrower internal diameter than the bars to stay in place (so they can be a struggle to fit or remove), lock-on grips are just the right internal diameter to slip onto any conventional bar (22.2mm external diameter where the grips slide on) without any effort. Once you slide on the grip, tighten the Allen bolt clamp and the grip is locked in place. Should you ever have to remove these grips, simply undo the bolts with a 3mm Allen key and the clamps and the grips will slide off without a struggle. Fits any mountain bike or hybrid bike flat or riser bar. Shock from the road or trail is continually (albeit subtly) transmitted via the handlebars to your hands. You notice a tingling sensation. You are experiencing ulnar nerve inflammation. This can lead to numbness or, worse still, carpal tunnel syndrome. As long ago as the 19th Century, physicians identified this condition and referred to it as 'cyclists' palsy'. Designed by ergonomic specialist Dr. Roger Minkow, Specialized Body Geometry mitts and gloves incorporate foam and gel padding exactly where required to help prevent this inflammation, while their BG grips are similarly shaped and cushioned to minimise pressure on the ulnar nerve.